The second season of Project Resound created the collaboration of some of the best names in the Indian music circuit, to create four amazing tracks. We spoke to Karsh Kale about his experience writing 'We All Fall' with guitarist Warren Mendonsa, Hidustani vocalist Ankita Joshi, and sarangi maestro Sabir Khan. “I try to do every track differently; I don’t stick to any formula or genre,” Karsh Kale tells us, when asked about his collaboration with Blackstratblues; son of late Ustad Sultan Khan, Sabir Khan; and Hindustani vocalist Ankita Joshi; for the second season of Project Resound. “So I guess it’s [the track] different because I always sit down with a fresh outlook on how to approach a piece of music.” Following a successful first edition, which featured a collaboration of Kailash Kher and Shreya Goshal, Project Resound, has brought together some of the best names in the Indian music circuit to pursue ‘purity of sound’. Karsh says, “To me, ‘purity of sound’ is really about being able to get the best analogous reproduction of something that we’re recording. If you can make the listener feel like they are in the room with the musicians, then to me you are closer to purity of sound.” With Warren Mendonsa playing guitars, Sabir Khan on sarangi, and Ankita Joshi on vocals, ‘We All Fall’ sounds like an honest representation of Karsh’s idea of pure sound. Written in Raag Shivranjani, the song features ambient sound structuring – signature of Karsh Kale – blending soulfully with Ankita Joshi’s vocals, creating the feeling of pleasantly suspended animation; with guitar work by Warren Mendonsa and the tablas by Karsh Kale, creating an aura of ambient electronica by analogous means. 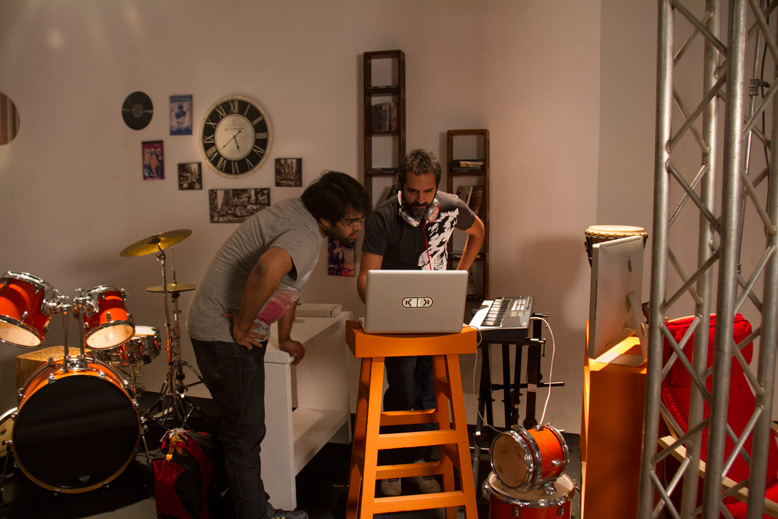 The track was recorded at Boing Studios, with the music video directed by Vijesh Rajan, portraying Karsh paving his way through the streets of a desolate city. “The music video was an all-night outdoor shoot,” Karsh tells us, “Where at many moments we almost got caught by the cops. All in all, it was a great experience.” Released on July 14 the music video for ‘We All Fall’ managed to rake in 1,50,000 views on Youtube in three days. Kolkata's electro-alternative act, Zoo, are an intelligent and excitable bunch who're always looking to stretch the boundaries just a little. Here, we speak with them about the multiple layers their name holds, their performance at India Music Week - III, and their debut release, The Attic Sessions, their Zooniverse, among other things. The Mumbai duo, Madboy/Mink, have been making generating quite a buzz with their eclectic music and engaging and energetic live sets. We had a short chat with the band about their music and their identity, among other things. A review of Bombay Sounds, a Mumbai Boss compilation. A review of Eyes Everywhere by A Mutual Question. A review of Dark Robot by Kerry Harwin.